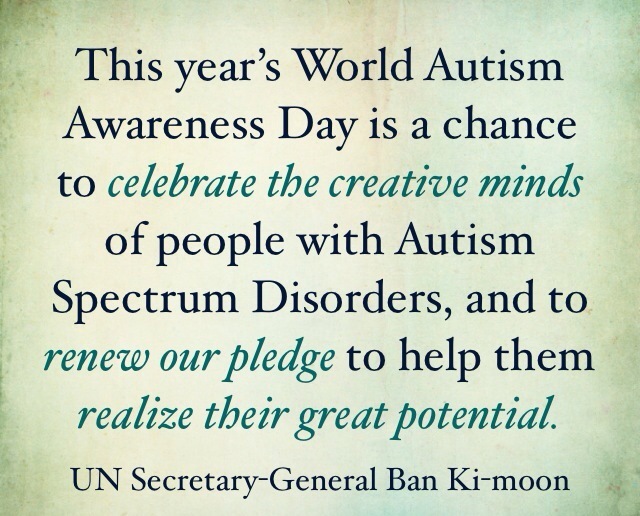 In 2007, the United Nations General Assembly unanimously declared April 2 as World Autism Awareness Day, aiming to promote the rights and well-being of the autistic around the world. The United Nations Convention on the Rights of Persons with Disabilities provides a strong framework for action to create a better world for all. In his call to participate in a “shared vision of a more inclusive world,” the Secretary-General references the UN Convention on the Rights of Persons with Disabilities (CRPD) – entered into force in 2008. This international human rights treaty, which extends the ideals of the Americans with Disabilities Act across the globe, has been ratified by 143 nations. Sadly, the CRPD has not been ratified by the United States – despite the advocacy of over 750 disability-rights groups (including disabled veterans) – due to misunderstandings and fear over the perceived effects of international agreements on domestic laws. It is shameful that the United States is allowing itself to be left out of the discussion and implementation of global disability rights. The United States should be a world leader in supporting the rights and personhood of people with autism and all disabilities. The CRPD ensures that other countries follow the spirit and promise of the ADA, and our ratification of it would allow the US to demonstrate support of the disabled worldwide, participate in the discussion on international disability rights, and strengthen our national commitment to the rights and human value of all people. 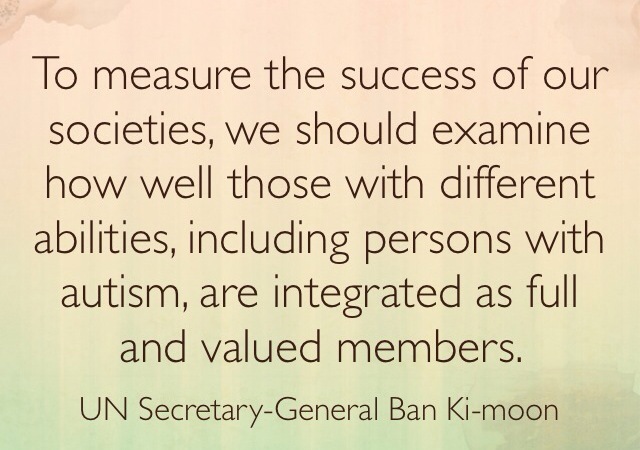 For this April’s autism awareness, I am holding a vision of acceptance and inclusion on a global scale. Please go to www.disabilitytreaty.org to learn more about the CRPD and why it is imperative that the US complete its ratification. Click on their Action Center to sign a petition and contact your Senators. Listen to Sen. Tom Harkin here and send him your stories to urge the Foreign Relations Committee to ratify this treaty. Feeling a bit worn out, myself, too – and so it was nice to come upon a message that actually didn’t make my skin crawl or make me feel hopeless. THANKS! And holding that vision with you – beautiful! It can get exhausting, can’t it? I was so relieved to read the UN Secretary-General’s statement – not too doom and gloom, just a call for acceptance, celebration, and a push for the hard work needed to make the world a better place for all of us. It’s a good vision! I referred to it in the monthly all-day faculty meeting at one school I teach at today. it’s a homeschooling joint and the teachers and admin were very touched. I talked a lot about how while he wants to meet people where they are he has such an inclusive vision that encompasses all of us having the CAPACITY and OPPORTUNITY to pursue our dreams as well. No condescension or “tolerance” there, just actual equal civil rights! Yay.